Consolidation of final keel block for first Air Warfare Destroyer. Image via Commonwealth of Australia, Department of Defence. 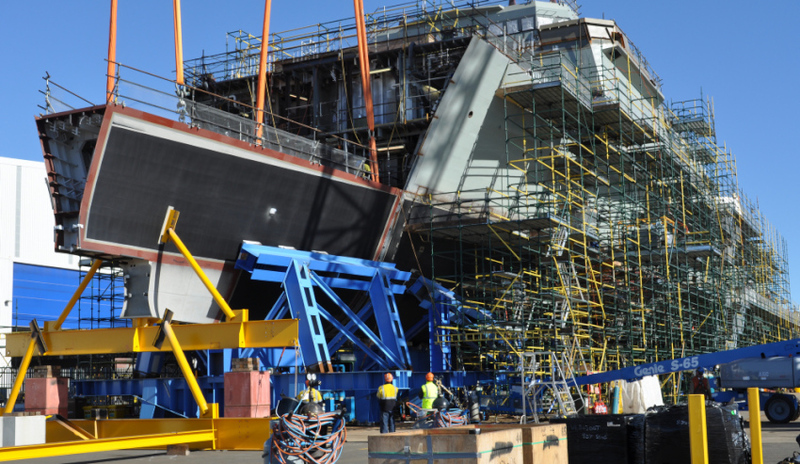 Construction of the Osborne South Shipyard facility will not alleviate the South Australian shibuilding Valley of Death, representatives from the Australian Manufacturing Workers' Union (AMWU) have said. At the announcement of Lendlease being selected as the constructor for the Osborne South Shipyard, which will be home of the build for the Future Frigates, Minsiter for Defence Industry Christopher Pyne said the valley of death at Osborne is over. "That's 600 construction jobs. Many of those will come from the work force down at Osborne who are being laid off because of the end of the Air Warfare Destroyer program, until the [Offshore Patrol Vessels] and the Future Frigates begin," he said. "The valley of death is over and we are now seeing [an] upturn of employment in naval shipbuilding in our state that will only continue to increase as these new projects gain momentum," he added in a statement to media. But AMWU's National Secretary Assistant Glenn Thompson said "no consultation between the government and the union and the workforce in relation to the announcement that Minister Pyne made" took place and that no measures have been put in place to retain the workers who are set to lose their jobs in the coming weeks and months. "The facility that is going to be built ... is civil works and building steel sheds," Thompson said. "We've currently got 1100 highly skilled shipbuilders at present which costs both ASC, the government, the taxpayers, private enterprise hundreds of hundreds of millions of dollars to develop. "We would say to that that the construction of this facility down there does not address the issue of the valley of death and we say the workers in ASC should be formed part of a transitional process with the government in respect to future frigates and submarines. "What we know is that 42 jobs have been earmarked already this year, it is expected 250 jobs will be gone by Christmas and upwards of four to five hundred jobs by June of next year, that's what we understand is still coming down the pipeline in respect to the valley of death as ship 2 of the Warfare Destroyer gets handed over to Navy." Construction on the Offshore Patrol Vessels project will begin in Adelaide in 2018. ASC is partnered with two of three tenderers, Damen and Luerrsen. An announcement on the successful tenderer is expected to be made by November this year.